I've got the car booked in with Bailey Performance on Febuary the 15th to have the ecu mapped so if everything goes ok it will be back on the road this spring. I need to try and book the car in with Procomp to have the front alignment set up and some heavier spring on the back, when the car was on the road the rear would bottom out on sudden dips in the road. How did the mapping go, what kind of power did it make and how are you finding it to drive? Sorry its the 15th of feb, the wait seems to be taking for ever. Last week I filled up the coolant system and found a leak, it was my own stupid fault. I now know that the water pump inlet gasket can only be fitted one way and this is with the tab facing away from the pump. With the tab facing the pump the gasket is to close to the edge of the inlet casting and can’t make a good seal. 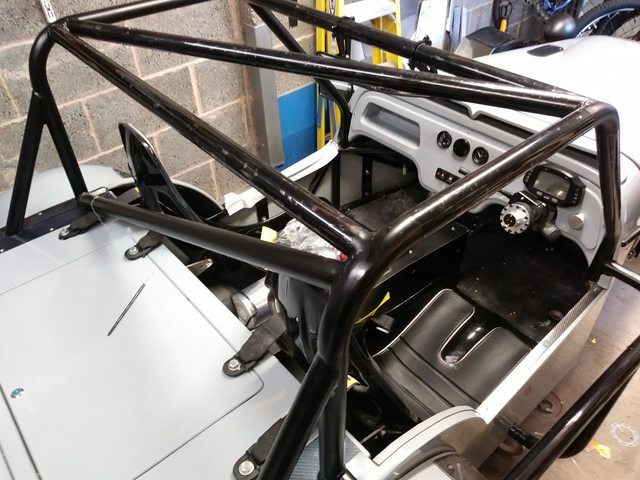 I was asked to take some pictures of the roll cage so I thought I would share them as we all like a photo. Instead of having hoops going across the chassis I’ve got them going along the chassis to improve clearance to my crash helmet from the bars that go along the chassis. I found with hoops going across the chassis the longitudinal bars are either on the top horizontal section and come into the passage area so the whole cage needs to be higher to avoid hitting the bar with the crash hat, or they are some where between the horizontal and vertical section of the hoop and just don’t look right. This is fantastic! I am doing the same to my own - turbo mx5. Your Davefab manifold - is this a log manifold? 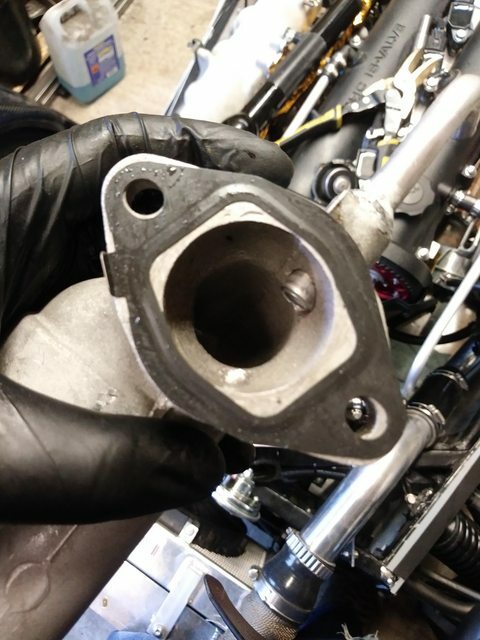 Hi yes, it is a log manifold, I think a custom made equal length manifold could fit with the turbo lower than the exhaust ports. I had the car on the rolling road but had a few problems which meant a full power run wasn’t possible. The first problem was my wiring, I had wired the COP’s and the injectors in cylinder order not firing order 1,3,4,2 not a big issue but it took time to identify and fix. The second problem was the alternator, I used a 1.8 alternator which came with an mx5 mk2.5 engine/gearbox a bought 18months ago. In turns out that mk2+ alternators are ecu regulated and as I’m using a megasquirt ms3 this is a function I hadn’t wired in, so the alternator wasn’t charging. The third problem was the engine getting hot, this was due to the turbo coolant out let going back into the cooling system bypassing the radiator, I have a suspicion the system had air in it and taking the coolant temp sensor out whilst filling should help. This is now being re-routed via the radiator and I’m going to use a wider opening thermostat. Fifth problem was clutch adjustment and air in the hydraulics, fist the clutch wasn’t disengaging I adjusted the push rod and then it slipped. It a new clutch so hopefully its not buggered and it down to adjustment and bleeding. Sixth problem was there is a small water leak and the back of the head which I think is coming from a rubber bung which may have split. Seventh problem was one on the injector seal was leaking, I hadn’t seated it right, so another lesson learnt. I’ve put a new alternator in and found that the mk1 1.8 and the mk2 1.6 share the same alternator pivot bolt and the mk2/2.5 1.8 and mk1 1.6 share an alternate bolt. And I had the wrong bolt luckily Autolink had one in stock and it was with me the next day. It looks like I’ve always had the later alternator originally had a 1.6 V belt but my engine now runs on the ribbed belt set up of the 1.8, this could be why my engine was running way to rich and nackered the engine in the first place. The water leak at the back of the head was due to the dash water temp sensor not being tightened up fully, I assumed as this was installed during the engine build and it was bench run that it would have been tightened up, I’m learning not to assume anything. I’ve re-installed the injectors, this time I used loads of Vaseline on the seals and it slipped in nicely I bit tight at first but when it was in it was great. When are you booked back in for the rolling road? 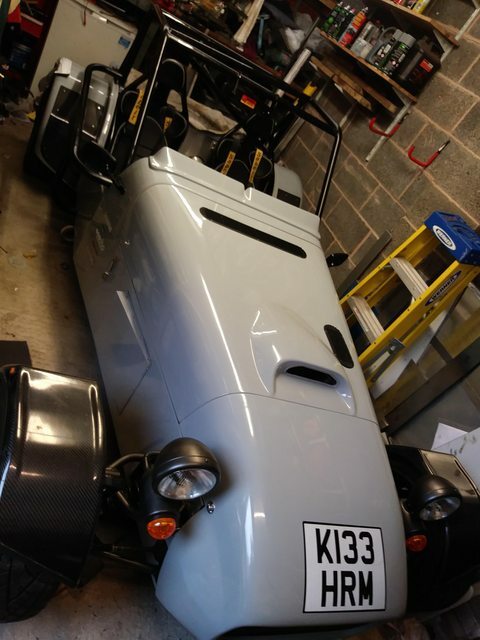 I’ve got mine running and it’s going in for rolling road on 11th March. Where did you buy your rear long bonnet vent, I could do with something similar. I'm not honestly sure that would cause the engine to get too hot,not ideal piped like that for sure. 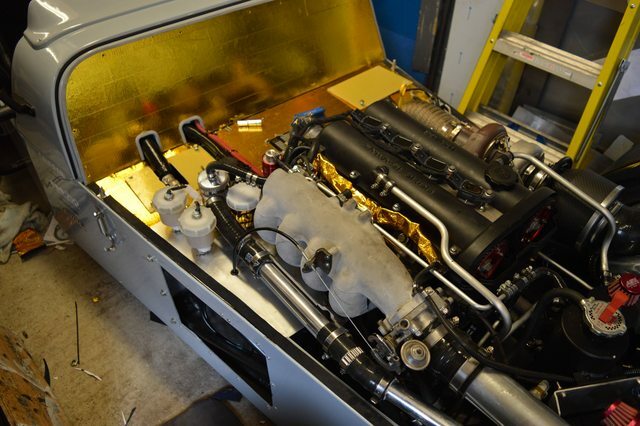 Just hope it's not the over heating issue rearing it's head that others have had with that rad/intercooler combo! Looking at the size of the thermostat opening (it a genuine mazda thermostat ) its not very big and the turbo water supply is 10mm and a lot shorter route for the water my thinking is a reasonable chunk of the hot coolant is just going round the uncooled circuit also being on the rolling road with fans is not going to help. If the problem persists, I’ll remove the intercooler and locate it away from the radiator probably using a long short intercooler sitting in front of the head with vents in the nose. It’s overheating because of your expansion bottle. After seeing your pics I bought a similar expansion tank and mounted it where yours is, it overheated and would not cool down. I went back to using my VW Polo expansion tank mounted on the bulk head and now it doesn’t get hot. The turbo return pipe won’t make a dot of difference to your temperature, you have air trapped in the system and it’s not bleeding into your expansion bottle and the water is getting hotter and hotter. Either mount your bottle higher on the bulk head or use a VW Polo tank. You want the small top pipe of the radiator rising towards the expansion tank so that any trapped air will escape into the tank, then the bigger return pipe T piecing back into the cold bottom pipe of your radiator. I have also used a good quality fan (Spal) and made some ducting for the radiatir from aluminium. I’ve used a VW polo tank in the past on this car and had problems so I don’t think the tank it self will make too much difference. I have the header tank set up as you described, and the fan is good quality and is tight to the radiator. 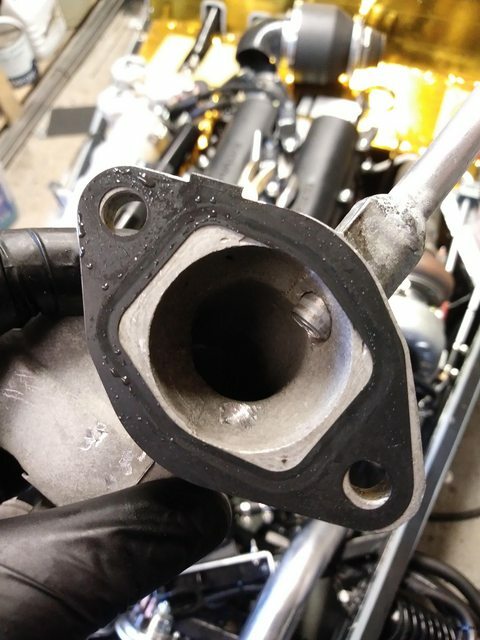 Looking at the cooling system yesterday and noticed that the radiator air bleed is slightly lower or about level with the head rear water outlet, I’ve just ordered a swirl pot to go at the back of the cooling system to help bleed off air, it’s a small one build for a fiesta RS turbo. If that doesn’t work, I’ll try a larger swirl pot with an integrated rad cap. The fiesta swirl pot has worked well I’ve had the engine running a couple of times and the cooling system is bleeding off air better now. I’ve not had the engine running more than 10mins yet due to an alternator problem. I replaced the alternator and found the Voltage was still low, a bit of investigation found that the alternator was at fault. 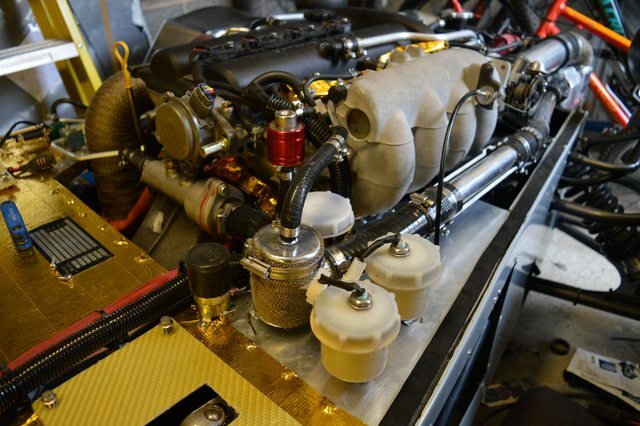 Not knowing much about car electrics, I posted the issue on here and Russbost identified the problem straight away and siad that the alternator needs a perm live and switched live with the dash battery warning lighting providing the switch live. A bit of investigation found that my Acewell dash which has a battery warning light does have not a direct connection to the alternator so I hadn’t connected up the switch live to the alternator, my dash wiring loom tail had the alternator warning light cable next to a spare perm live so an easy fix once I knew what the problem was. I purchased a Clarke CHT857 Brake and Clutch Bleeding Kit with a universal adaptor to fit my OBP brake and clutch reservoirs. The adaptor was a load of crap, to get a tight enough seal resulted in the adaptor bowing which when tested using air pressure is ok but when brake fluid is added it leaked everywhere. I’ve sent the bleed kit back and bought a cheaper Sealey version which has a reservoir cap which I can take apart and use the parts to modify a spare OBP cap I have collecting dust. How are you getting on with remapping on the rolling road? 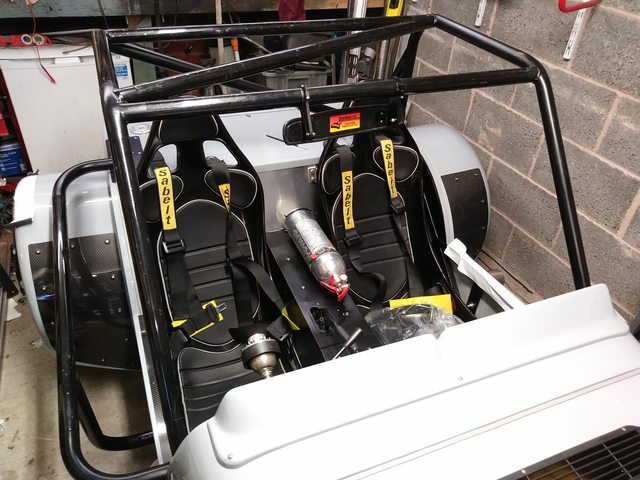 My 1.6 MX5 turbo engined kit car has just been set up, he used the electronic boost controller to keep the torque at 210ftlb on a nice flat curve from 3500-7500rpm and 250bhp. Looking forward to trying it out on the track next Monday. I’ve had a problem with the clutch which I’ve had to change, I bought a new clutch a year ago from Skuzzle Motorsport to have it balanced with the engine only to find out when on the rolling road it was dragging badly then slipping when it got hot. The problem was with the friction plate being 1mm to thick, it is a modified standard plate Exedy with ceramic pucks on one side, I assume Skuzzle motorsport had it a batch commissioned. The pressure plate was heavy duty but lacked the appropriate throw to disengage the clutch. I’ve fitted a new clutch and found one maybe two water leaks, the inlet manifold gasket appeared to be leaking from a water way between cylinder 3&4 which is blocked off by the manifold, and the thermostat housing on the rear (Coolant reroute) appeared to be leaking. The two are close together it is possible it could be one leak making the other area wet, I decided to change both gaskets to be on the safe side. On the inlet manifold I used a paper gasket but the oem gasket is metal, I’m fitting a metal oem gasket when it arrives. When all the problems are fixed I will book some more time on the RR. The test drives I’ve had so far have been good, the turbo spool isn’t noticeable which was my plan and that is why I when for a smaller turbo garret gt2554r, if i want more power it isnt a lot of work to swap to the GT2556r.